Traveling by plane is cumbersome and tiring. You have to bring everything you think you might need, as well as a few extra days worth of clothes in case of emergencies, and arrive insanely early to get through security. If being at the top of the weight limit for your luggage, carry on, and personal item wasn’t stress-inducing enough, there’s always the added bonus of having to lug it all over creation. If you hate running from gate to gate and wish you didn’t have to expend so much energy during an already taxing journey, then why not integrate a scooter into your luggage? 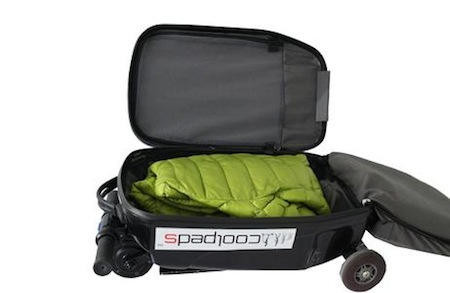 The Coolpeds Breifcase E-Scooter is the perfect way to zoom around the airport without having to use any of your own personal storage of energy. It can go up to 10km on one charge, and can zip around at 20km an hour. The handlebars can be adjusted just like any other scooter, and it will fold down quickly whenever you no longer need to ride on it. There are solar panels available for an extra $100, which is going to make the introductory price of $599 jump up even higher. If we’re going to be honest with ourselves, this is a massive waste of money. Especially in regards to the solar panels, as carry-ons hardly even see the light of day and would be useless unless you turn this into your main bag for everything. There’s no need to move this fast, and if you really must, there are carts in airports to get you from point A to B faster.